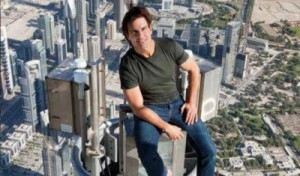 Tom Cruise etched a love note to Katie Holmes in the spire of Dubai’s Burj Khalifa while filming stunts for Mission: Impossible 4- Ghost Protocol. Mission Impossible star Tom Cruise reportedly penned a love note to his wife, Katie Holmes, and children atop Dubai’s Burj Khalifa while filming stunts for his latest movie. The Hollywood superstar who spent four days filming action scenes for ‘Mission: Impossible 4 – Ghost Protocol,’ is believed to have scrawled the message – along with a heart doodle – in the top spire of the world’s tallest building.